The development using an ARM device is exciting, but sometimes it’s more time expensive. 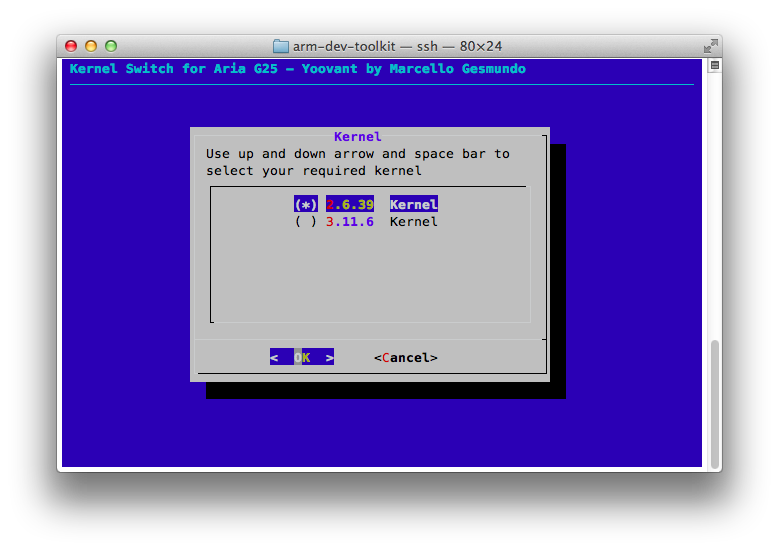 The ARM toolkit utilities is a collection of scripts published on my GitHub repository. When you want to try a new Linux kernel version, you must download the new kernel and compile it (or download a ready to use version from the manufacturer) and upload it into the SD card, changing, if required, the bootloader and some other thinks. To simplify the switch from a kernel version to another, I’ve prepared a shell script that simplify this process. In other words your first partition of the micro SD card must have a directory for every kernel version you want, named as the version, without other chars. NOTE: you MUST download the boot128.bin file if your board is equipped with 128MB RAM.